Some of the therapists listed on this page offer therapeutic, full chest & breast massage within a full body wellness session. Other therapist offer specific breast massage treatment sessions to support recovery from illness, trauma or other issues causing problems in the breast tissue. Jamie Elswick, LMT in Anchorage, Alaska. Jamie Elswick also teaches continuing education classes. Luis Molina, LMT ~ in Lakewood, CA: Luis includes chest ad breast massage when treating shoulder injuries, and respiratory conditions such as asthma and emphysema. He also includes breast/chest massage in full body, stress reduction focused massage sessions on request, with signed consent. The Chopra Center ~ Carlsbad, CA. The Chopra Center employs multiple therapist. Their menu of services includes Ayurvedic Breast Massage. Bodywork Wisdom: Eeris Kallil, LMT is a breast cancer survivor who teaches breast massage for people with cancer: Eeris Kallil practices and teaches classes in Colorado and also travels to other states to teach. Michael Vogt, LMT ~ of Back In Health Massage, in Tampa, Florida. With client consent, Michael works with the chest undraped. His massage focuses on the muscles of the chest and the abdomen as they relate to neck, shoulder, and low back problems. He will perform specific breast massage on request. Emma Macniak, LMT of Midwest Bodyworks Massage Therapy, in Mundelein, Illinois. With client consent, Emma preforms breast massage for new mothers, post mastectomy, postural dysfunctions and if it's requested. Edward Miano, LMT, Healing Hands Bodywork, in Boston, and Needham, MA, also on Martha's Vineyard. With written and verbal client consent, Edward preforms chest and or breast massage for post mastectomy, new mothers, postural dysfunctions and if it's requested, to be incorporated into full body, wellness focused, Lomi-Lomi massage sessions. Roy Yehuda, LMT, in Newton Highlands, MA. Roy offers full body massage, combining different massage modalities including Swedish, lomilomi, deep tissue and hot stones to provide complete relaxation of your body and soul. As part of the treatment, with your consent, he includes therapeutic chest and breast massage. Treatments are in his home office or in the comfort of your own home. Allysa Bedard, LMT, in Merrimack, NH, trained and experienced in prenatal massage, lymph drainage therapy for breast tissue, and more. Roland Curit. LMT, at Me Time Wellness Center in Dover, NH. Roland received his breast massage training from Cheryl Chapman, a nationally recognized therapist and breast health advocate. With informed verbal consent, Roland will include breast massage as part of his client's wellness routine. Both is his wife and mother are breast cancer survivors. Sally Spurgeon, LMT at Therapie in Las Vegas, Nevada. Sally offers breast massage for healthy breasts and also as treatment for folks recovering from breast surgeries such as mastectomies, reductions and/or enhancement. A breast cancer survivor herself, for nearly a decade Sally has been helping women overcome the pain associated with breast surgery through therapeutic massage. Marina Dimicelli, LMT, New York City, NY. Dasha Enterprises. Marina is certified in breast massage. Oaks Massotherapy and Botanical Spa, Rocky River Ohio. This spa offers breast scar tissue massage to release chronic pain and decreased motility after surgery. Relieves lymphedema, cramping and tenderness. Increases circulation to restore subtle breast tissue. Proven successful after lumpectomy, mastectomy, tramflap reconstruction, implants, expander, radiation, contractures, keloids and seromas. Jasper Moon, CPM, LMT, Portland, OR. Jasper is a midwife, doula, and massage therapist, who offers pelvic floor manual therapy as well as chest and breast massage. Their clientele are mostly prenatal to postpartum folks, and the queer/ trans community. Angie Ringwald, LMT, Portland, OR. Angie serves clients who have chronic pain, injury, anxiety, and those seeking deep relaxation. She uses lomilomi, yoga and biodynamic craniosacral. She also integrates breast massage into full body wellness massage on request. Tony Ruggiero, LMT in Greenville, SC provides breast massage for both general wellness and treatment of conditions. Manuel Aranguren, LMT, CMMP in Dallas and Fort Worth. Manuel provides manual therapy for the breast tissue and/or lymphatic drainage massage (1) to provide pre/post-op treatment for breast augmentation/reduction/lift (2) to address chest pain, PMS, stress, benign lumps and (3) within integrative full body lomilomi sessions. Prior signed written consent always required. Ellen Bloom, LMT, has a solo practice in Seattle, located in the Heart of Fremont. She includes breast and belly massage in her gentle, firm, layered approach. Her primary goal is assisting clients in feeling more at home in their bodies. 206-323-8929, bloommassage on FB. Jodi Boone, LMT, in Wallingford area of Seattle, WA. Jodi is an Ayurvedic and yoga practitioner. Rochelle Clark, LMT, CLT), in Queen Anne in Seattle. The Art of Healing Touch. Rochelle specializes in lymphatic drainage massage. She offers breast massage for wellness support, breast reduction, breast augmentation, and for women pre and post cancer treatment. She also works with lymphedema clients. Hyla Dickinson, LMT in Seattle, WA. Hyla offers lymphatic drainage massage therapy. Trish Foss, LMT of Evergreen Ayurveda in Seattle. Trish offers full body Ayurvedic treatments which include full chest and breast. Libby Golden, LMT, in Seattle, WA, is also a doula and Dancing For Birth(TM) instructor. She provides women with full chest massage as part of pre and postnatal maternal health, general wellness and treatment. Her private practice is located at the Center for Birth in Eastlake and she also provides in-home maternity massage. Nicole Gonzalez, LMT. in West Seattle, WA. 206-799-0718. Ayurvedic practitioner. Karen P. James, LMT in Shoreline, WA. Alexis is experienced with oncology massage, lymphatic drainage, and more. Alexis Kurtzman, LMT in Bellevue, WA. Alexis is certified in oncology massage, and more. Aubrey Lesicki, LMT in West Seattle, WA. Aubrey owns Breast Remedy and focuses her entire practice on treatment of breasts. She also teaches continuing education classes. Martha Read, LMT in Seattle, WA. Martha specializes in both lymphatic drainage work and pregnancy massage. She integrates breast and chest massage into full body wellness massage and for treatment of related conditions. She also specializes in Watsu Aquatic Bodywork. Karen Asbury, LMT, in Vancouver, WA. Karen offers full chest and breast massage as part of a wellness massage and also offers breast massage to support lactating mothers. She is certified in the Arvigo Techniques of Maya Abdominal Therapy® and her practice serves all women with sacred feminine bodywork and self care instruction. Lynna Dunn, LMT, in Bellingham, WA, uses deep tissue massage and massage cupping to decrease tension, pain, and anxiety. She may include breast/chest massage when treating shoulder, neck, or back pain; breathing restriction due to chronic asthma or bronchitis; or post-surgical pain or scarring in the breast/chest area. On request, she includes breast/chest massage in full body, stress-reduction sessions. phone/text:425-328-8823. 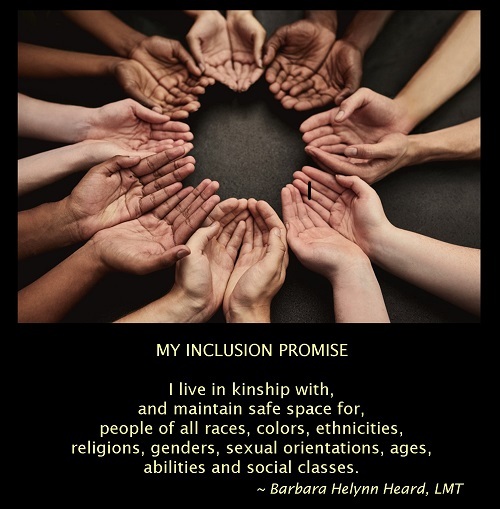 Barbara Helynn Heard, LMT in Olympia, integrates breast massage into full body wellness massage for all clients who choose this option. She has experience working with clients who have had breast augmentation, breast reductions, mastectomy and other cancer treatments. Meghan Hintz, LMT, in Olympia, WA. Meghan offers therapeutic massage to address the whole body, including abdominal and full chest and breast massage for clients who choose these options. Her practice is body-positive and LGBTQIA+ inclusive. Patricia Jerke, LMT, in Cle Elum, WA. On request, Patricia offers breast massage and chest Massage for post mastectomy, postural dysfunction as well as general wellness. Annie Monroe, LMT, in Bellingham, WA. Annie is a a Vodder trained Combined Decongestive Therapist (CDT) and works with lots of breast cancer patients using Manual Lymphatic Drainage. Rachael Scott, LMT in Edmonds. Rachael offers breast massage treatment for medical issues such as cancer recovery. Brian Shute, Ph.D., LMT in Spokane. Brian offers chest work with informed, written consent for medical, pre/post surgical, and/or wellness purposes. Pam Fitchner, RMT, at Sephira Healing, Saskatoon, SK. Pam is passionate about women's health, especially breast health and education. She provides breast massage for healthy breasts as well as treatment massage to help with recovery from trauma.